Some Uses of Photography: Four Washington Artists at American University’s Katzen Arts Center is a unique kind of photography show. In a dark room tucked away on the third level is an intriguing exploration of how photography is used to make art. I was delighted to see that Phyllis Rosenzweig, a former curator at the Hirshhorn Museum and Sculpture Garden, organized the exhibition—she was, big disclaimer, one of my thesis advisors, so I asked to interview her about the exhibition and how it serves to change the dialogue of cataloguing photography in contemporary art. Three years ago, when the meeting took place, Rasmussen wasn’t interested in exhibiting solo shows. Since many of the artists Rosenzweig admired were women, they began discussing an all-woman photographers show, and planned the show to coincide with the 2014 Feminist Art History Conference at the Katzen Arts Center—where three of the four the artists will be speaking. However, Rosenzweig asserts that this is not a show primarily about a feminist esthetic. Rosenzweig wanted to understand how these women use photography—only Ren and Rottman self-identify as photographers. Ren creates ethereal images that depict reoccurring natural patterns and architectural forms like windows, doors—“portals”—that she observed during a nomadic period in her life. The exhibition features her uses of analogue photographic practices—color film, dark room processing, and a slide projector—a disappearing technique of photography that is being conquered by artificial filters to make digital photography look like film. 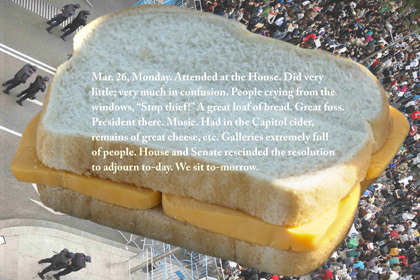 Rigg juxtaposes both found images and photographs she takes with text, performances, and other media to explore a series of events involving large items: the discovery of mammoth bones in New York, and the gift to the White House of a giant, 1,234 pound block cheese from the residents of Cheshire, Massachusetts and a riotous party held by the Senate. Rigg responds to these events by comparing contemporary large events such as the Keystone XL Pipeline protests and the concept of organizations being “too big to fail.” Rigg uses photography as supplemental material to demonstrate a larger historical relationship between trans-generational political agendas. We began to discuss photography and its context within contemporary art. I ask what her thoughts are about photography as a medium, and what the uses of photography mean in contemporary art. Rosenzweig says, “It’s a complicated issue because I think there are still two camps.” The first camp are artists, curators, and writers who see photography as its own identity. These people call themselves photographers, curators of photography, photography writers. The second camp are people who see a greater fluidity in the medium of photography. 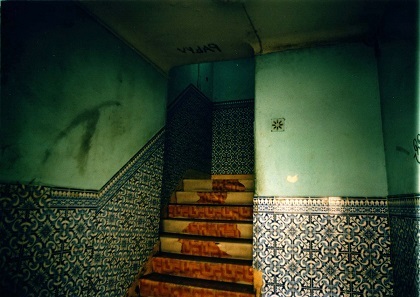 They are using photography as a way to explore broader conceptual ideas. They are artists–who do not consider themselves photographers–using photography as a tool to help exhibit, either their process or final concept. 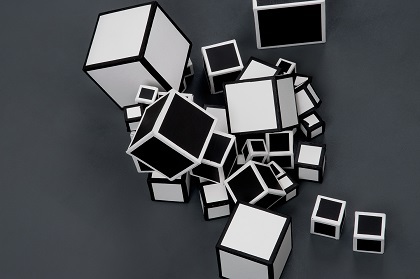 For instance, in 17 Cubes, which Jenn DePalma conceived, constructed and painted 17 black and white cardboard boxes of varying sizes, then slipped the cubes down a tube tumbling to a flat surface. She calls the random configurations in which the cubes land a still-life. She had a colleague photograph the still-life, and DePalma made graphite drawings of the images. DePalma was “hoping to add value to the photography,” says Rosenzweing. “The copy of the original photograph looks like a drawing and the drawings look like photographs.” DePalma isn’t concerned that the photographs or drawings represent the identity of a medium but challenges the capacity of how a medium operates—alone or juxtaposed with other media. Exhibiting the diverse works and uses of photography by DePalma, Ren, Rigg, and Rottman promote more questions and inquires about the photographic medium–it’s perhaps most telling that Some Uses of Photography needs to be labeled as a photography exhibition for the much of the work within it to be considered to be photography. Washington, DC 20016. Admission is free. Tuesday through Sunday, 11am-4pm. The 2014 Feminist Art History Conference, American University, Katzen Art Center, October 31 – November 2. Gallery Talks with the artists on November 2 at 1-2 p.m.